Since I've been in the Los Angeles area for about a year now, I've had the opportunity to attend some of the most interesting and exciting events. Also, at these events, I've met many great people and am thrilled to be able to list the events I've attended here in one concise place. 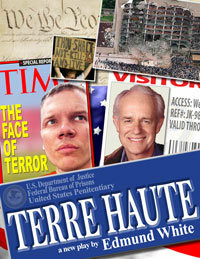 All of these articles were first published on The Vault - TrueBlood-Online.com and/or AllStephenMoyer.com. Premiere of Jim Parrack's film "Post" - June 10, 2011 - Exclusive coverage of the premiere of Jim Parrack's new film, POST with videos of the Q&A after the film was viewed. Outside the True Blood Set with Stephen Moyer May 16, 2011 - I met Stephen Moyer outside the set of True Blood in downtown Los Angeles. Toyota Pro/Celebrity Grand Prix Race April 15/16, 2011 - I received an invitation from @ToyotaRacing on Wednesday of last week offering me exclusive access to the Celebrity compound on Friday, April 15 at the site of the Toyota Pro/Celebrity Grand Prix. True Blood Says, Happy Birthday Tennessee Williams - The Katselas Theatre Company‘s ongoing monthly INKubator series presented their performance of Happy Birthday Tennessee, yesterday, Saturday, March 26 at the 99 seat, Skylight Theatre which is located in the Los Feliz section of Los Angeles. I attended the event to see three of the True Blood cast members, Deborah Ann Woll, Jim Parrack and Dale Raoul read from the writing of the great 20th century author. True Blood at Paley Fest, The Full Scoop - On March 7, 2011 I experienced my second True Blood PaleyFest event. I attended the True Blood panel discussion in 2009 which was a blast, but what a difference two years have made. True Blood Cast signs Comic Book, Series 1, All Together Now - February 27, 2011, I attended the signing of the True Blood Series 1 comic, All Together Now by cast members of True Blood which was held at the Barnes & Noble store at The Grove at Farmer's Market in Los Angeles. Expected to attend and sign were Deborah Ann Woll, Sam Trammell, Rutina Wesley and Nelsan Ellis. Unfortunately, although all four were expected, it seems that, at the last minute, Nelsan was unable to be there. Seeing Michael McMillian and Deborah Ann Woll at Bagged And Boarded - Wednesday night, I went to Hollywood to the Smodcastle to see the taping of Matt Cohen and Brendan Creecy's podcast "Bagged and Boarded". 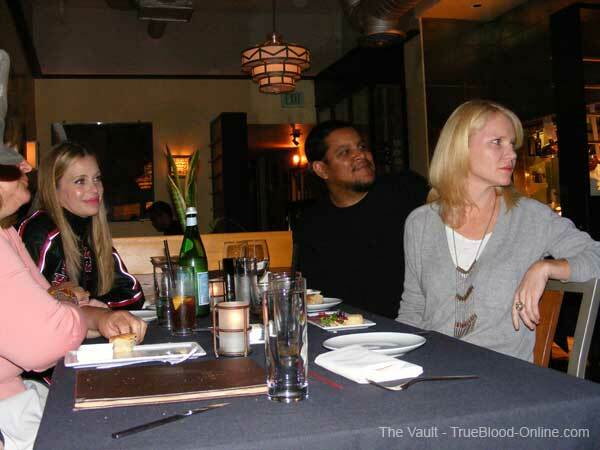 Appearing on the podcast was True Blood's Michael McMillian and Deborah Ann Woll. And, half way through the taping, joining the others on stage was also veteran comics writer Marc Andreyko who has teamed up with Michael to script the next arc of IDW Publishing’s “True Blood” comic book series which is due out next week. Rutina Wesley and Sam Trammell at "A Pretty Filthy Evening" - Saturday night, February 5, 2011, True Blood's Rutina Wesley and Sam Trammell appeared in the one-night-only cabaret presentation of "A Pretty Filthy Evening" at the Kirk Douglas Theatre in Culver City, California. The evening's program included excerpts from the work-in-progress musical about the adult entertainment industry that, when complete, will be called, "Pretty Filthy". half the stars were. 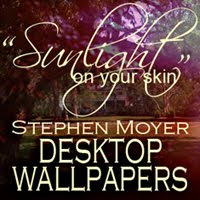 I, of course was only there to see Stephen Moyer. 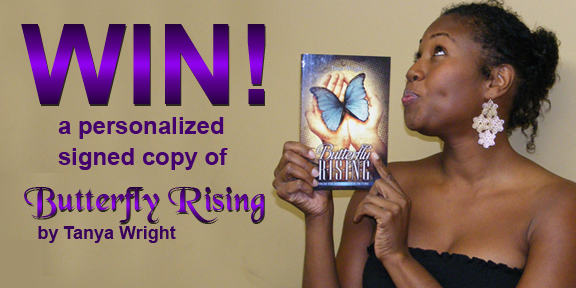 Tanya Wright's LA Book Debut for Butterfly Rising - On December 16, 2010, I attended her book signing and was privileged to get a brief video interview with her and hear the reading of two passages from her book. What I experienced, was a woman who is driven by her creativity and passion to tell a story. While she readily admits that she is an actor at heart, she has also always had a passion for writing. However, her interests don't end there. She not only wrote the book, but she has also turned it into a movie on which she had her hand in every aspect of its making. She wrote, directed and produced it, and also edited the final film. She is truly a 21st Century version of a Renaissance woman. Stephen Moyer Recites "The Grinch" at Universal - One thing I've learned about Stephen Moyer is that he has a very generous and giving nature. I experienced that yesterday, December 11, 2010 when I went to Universal's Theme Park in the San Fernando Valley, near Los Angeles, CA and heard him read, from Dr. Seuss' "How The Grinch Stole Christmas". My friend, Chelsea and I went together to the park yesterday and we had a wonderful time and even got to speak with Stephen after the show. Rutina Wesley and the cast of "A Raisin In The Sun" radiate! - On November, 19, 2010 I attended the premiere of the radio recording at the LA Theater Works of the Pulitzer Prize-winning classic, "A Raisin In The Sun". The play was written by Lorraine Hansberry and, in this production, has a great cast including True Blood's Rutina Wesley. Sam Trammell performs at Actors for Oceans - On November 14, 2010 in West Hollywood, the surf was up!I attended a charity gala event for Project Save our Surf, called "Actors for Oceans" at the Falcon Restaurant on Sunset Boulevard. The event's purpose was to raise awareness and gather contributions toward keeping our oceans clean and to support the organization. Ryan Kwanten's Red Hill is a gem! 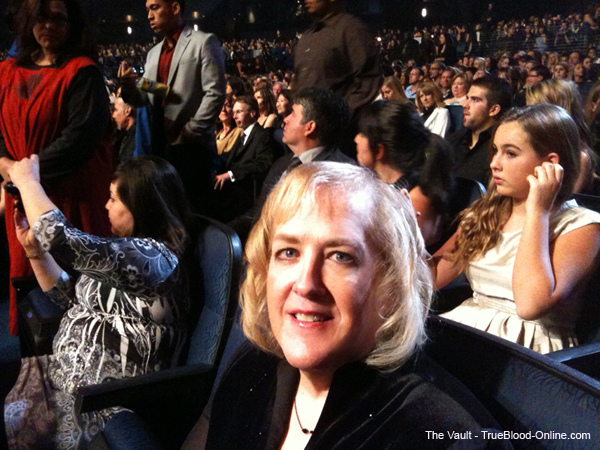 - On October 26, 2010 I went with my friend, Pinky to the Australian's in Film, LA Premiere to see the screening of Patrick Hughe's Red Hill starring True Blood's Ryan Kwanten at the Harmony Gold Theater on Sunset Boulevard in Hollywood, CA. 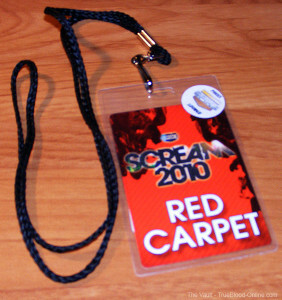 2010 Scream Awards - A Press Experience - On Saturday night, October 16, 2010, I had the wonderful experience of attending the 2010 Scream Awards.The Vault was given two Press Passes that included the Red Carpet for me to attend as Co-Admin and a fellow Billsbabe BittenByBill (BBB) to share the experience with me. BBB had been to the event last year, so she was a great help in explaining the ins and outs of the event to me.It was a chilly and drizzly evening when I got to The Greek Theater in Griffith Park, Los Angeles, CA. Jim Parrack in “Terre Haute” at The Blank Theater - On October 7, 2011 I was happy to be Jim Parrack’s guest at his new play, Terra Haute. Jim is co-starring in this two man play with Mike Farrell of “Mash” fame. I arrived at the prescribed time to pick up my tickets at The Blank Theater in Los Angeles and was happy to notice that also attending this performance was the lovely Deborah Ann Woll (Jessica). I had met Deborah before when I attended her boyfriend EJ’s Improv event at the iOWest in June. That was also where I met Jim Parrack for the first time. Meeting Sam Trammell and his surf for charity - On September 12, what a better way to spend the day than to watch the ocean waves carry many celebrities on their surfboards. Yesterday, September 11, I drove to Malibu up the Pacific Coast Highway to just north of the Malibu Pier. It wasn’t easy, or cheap, but I found a place to park my car very near the day’s event. I was there for the Surfrider Foundation Celebrity Expression Session. One of the celebrities attending was True Blood’s Sam Trammell and, of course, that was the main reason I went. 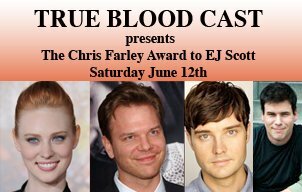 True Blood Cast Participates in iOWest Festival - Last Saturday night, I attended one of the iOWest Festival performances at the iOWest Improv Theater in downtown Hollywood, The performance I attended was the E.J. 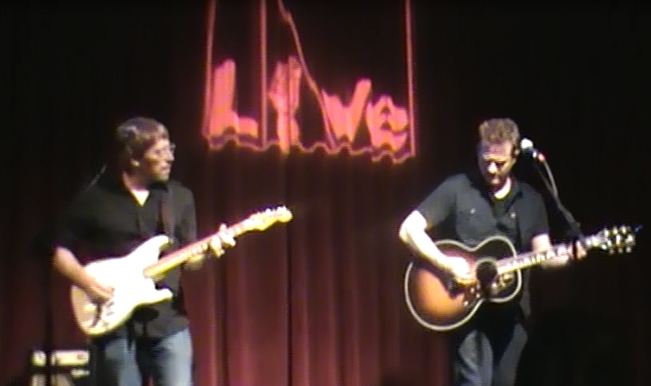 Scott Improv session where he was awarded the Chris Farley award. Also at this event were three True Blood cast members, EJ’s girlfriend, Deborah Ann Woll (Jessica), Jim Parrack, (Hoyt) and Michael McMillian (Rev. 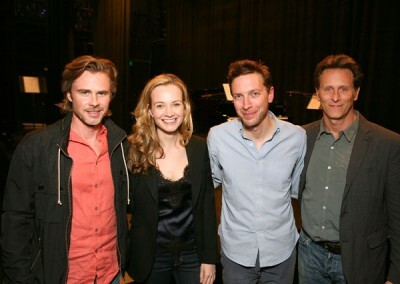 Newlin). Before the show I spent some time with Deborah, E.J., Jim and Michael. Article: Jace Everett at Philly's World Cafe Live - On June 1, the town of Philadelphia, my home town, hosted the talents of Jace Everett at the World Cafe on University of Pennsylvania's campus. As I'm sure you all know, Jace is the composer of True Blood's title song, "Bad Things".